Warning: This story contains some graphic language. David Hogg, a student at Marjory Stoneman Douglas High School who survived last month's mass shooting and is now a “March for Our Lives” organizer, gave a profanity-laced interview with The Outline earlier this month that was dramatically different from his other media appearances on outlets like CNN or MSNBC. "It's like when your old-a** parents are like, ‘I don't know how to send an iMessage,' and you're just like, ‘Give me the f**king phone' and you take it and you're like, ‘OK, let me handle it,' and you get it done in one second," Hogg said. "Sadly, that's what we have to do with our government because our parents don't know how to use a f**king democracy, so we have to." Hogg also used some strong language to describe the National Rifle Association. 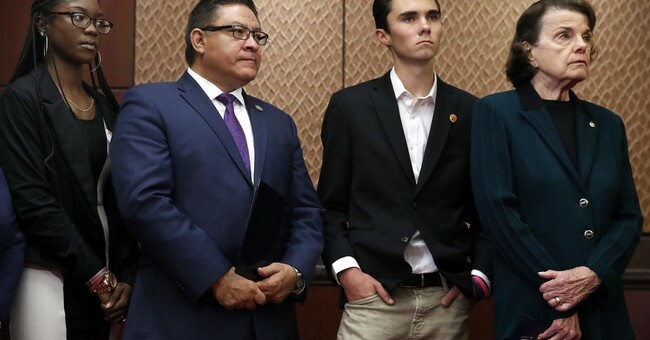 "They're pathetic f**kers that want to keep killing our children," Hogg said of the NRA. "They could have blood from children splattered all over their faces and they wouldn't take action, because they all still see those dollar signs." He slammed the Florida state legislature for rejecting legislation that would ban assault weapons in February. "It just makes me think what sick f**kers are out there that want to continue to sell more guns, murder more children, and honestly just get reelected," Hogg said. "What type of person are you when you want to see more f**king money than children's lives? What type of sh**ty person does that?" "Honestly, it's alright that people are buying more guns," he said. "I just care that they are being safe individuals and they can practice their Second Amendment rights all they want. I don't give a f**k about that. I just want to make sure that a crazy a** individual doesn't get an AR-15 or any weapon at all." He called for a ten percent tax on all firearm sales, the minimum age for gun ownership to be raised to 21, and universal background checks.